Guess what... I am teaching my very first SkillShare class! I love crafts and I often document how I make them so what better way to share the love than to teach others and share my process and methods? For my first class you will learn how to create a folding paper card that seemingly has two sides, but actually has four. Watch as your creation implodes on itself to reveal the hidden pages. In this class I will be demonstrating how to make one of these with an illustration example, but it's also great for photos, collage and invites. This origami-esque project looks complicated but can be done by anyone once you know the secret! In my example I have illustrated a few of my favourite characters from Hunt For The Wilderpeople with the style I use in my Little Brown Notebook. 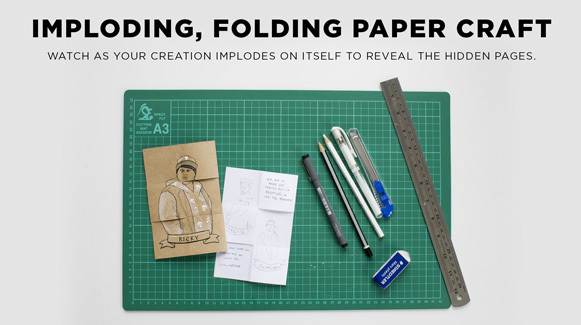 Take my Imploding Folding Paper Craft class today for only 99 cents! By using this special link, not only will you be able to enroll in my class, but you'll also gain access to all other classes on Skillshare for just 99 cents! For three months, you can learn from the best in design and crafts, all for less than a dollar.